Good dental hygiene is important to smile health, but it is only one of many factors involved in getting a smile that is both healthy and attractive. 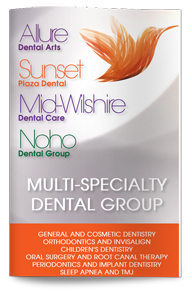 Our dentist in West Hollywood works closely with each of our patients to create completely customized treatment plans to meet their unique dental health needs. Periodontal disease and tooth decay are the most common dental problems we see. Our Aetna HMO dental insurance dentist in West Hollywood offers periodontal treatments that can restore gum health, stop the spread of the infection and rebuild lost gum and bone tissue. Decayed teeth can be restored using dental fillings, inlays, onlays or porcelain crowns. In some cases, a diseased tooth may need root canal therapy or other treatments to ensure continued dental health. When a tooth must be extracted, we will recommend appropriate restorations that can preserve the beauty and function of your smile. Chips, worn enamel and missing teeth can take away from the beauty of your smile. They can also affect dental health and function. Dental bonding, dental implants, dental bridges, dentures and other restorations can correct minor flaws or replace missing teeth. When your teeth or jaws are misaligned, they can make even the simplest tasks difficult and may even trigger pain and other symptoms. We offer treatments for TMJ disorders, bruxism and orthodontic problems to keep your smile functional and comfortable. Invisalign is also available to straighten teeth comfortably and discreetly. Stains may leave you looking older than your age, and they can make you feel self-conscious. We offer several teeth whitening solutions as well as porcelain veneers and Lumineers to eliminate common stains or conceal tougher stains such as those from antibiotic use. Contact our dental office today to learn more or to schedule your appointment with our West Hollywood Aetna HMO dental insurance provider.